Asheville, NC Violin Lessons Near Me | Fun Classes. Top Tutors. Check out some of our most popular teachers near Asheville, NC including Weaverville, Arden, Swannanoa, Hendersonville and Candler. My name is Stephanie Quinn and I moved to Asheville from Chicago one year ago. I auditioned and won seats in three professional orchestras. I split my time between teaching, orchestra work, composing and playing weddings. Asheville is a tourist hub, attracting nature lovers and musicians. Many people move here from Chicago and New York City, because of its eclectic artistic and sophisticated flavor. We have an opera, 3 orchestras within 40 miles, a ballet, several theaters, and countless live music venues. There are many sources of inspiration for violin students, whether one is interested in classical or fiddling styles. Whether you're a half hour drive from Asheville or live within the city itself, one has a choice to see Hendersonville Symphony, Brevard Philharmonic, Asheville Symphony almost every weekend. Each orchestra has several violinists who are also high-end instructors. If you are a student in Asheville area and participate in a student recital, you may expect a lovely turn out and supportive audience… and not just the parents of the participants! This area has a heavy retirement-age population, so music concerts are well attended and enthusiastically supported. The Asheville Amadeus Festival drew huge audiences for the workshops and master classes, and our GRAMMY award-winning guest piano soloist was Emanuel Ax. Another fabulous event each summer is the Brevard Music Center Festival which includes over 80 opera, chamber and orchestral performances over a seven week period. World class musicians come to perform, and about half the events are free of charge. It is very inspiring for students to be exposed to performances of such a high level! If you are interested in fiddle music, there are many choices of restaurants or bars to listen and learn every night of the week! After I rehearse with Asheville Symphony I often hit one of the local spots to relax and listen to old town, blues, country, gypsy-jazz, and Irish fiddle music. I recommend a few of my favorites: Weinhaus on Patton Ave, 5 Walnut Wine Bar, The John Henry’s, and Hot Pint Trio. Weinhaus has the best oldies and bluegrass music I’ve ever heard. I’ve seen fiddle players possessing the technique of a classically trained virtuoso violinist. Beginning violin lessons in Asheville can tap you into a rich community of talented musicians. I work with the gypsy fiddler who performs at John Henry’s, 5 Walnut, and Hot Pint Trio, as well as a GRAMMY award-winner who plays with Paul Winter Band at many of these venues. 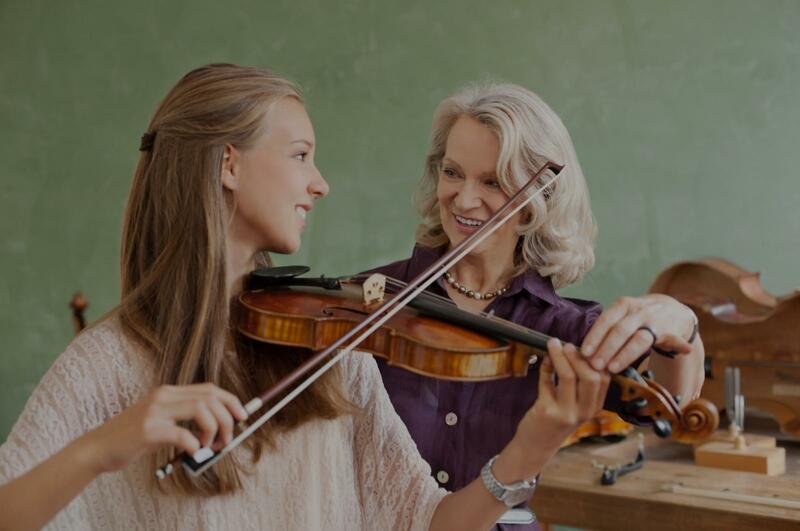 Beginning violin lessons in Asheville can seem a bit daunting for someone who is just starting out, but remember that practice and enthusiasm will pay off! Two of my students have already placed in prestigious competitions. I also coach the local premiere student string quartet. They’re in great demand and get to perform and make money all around this area. What makes Asheville special is that people here live with intention and passion. Start violin lessons today and enjoy talented, brilliant people who make beautiful music in our wonderful city! I began privately instructing students while I was still in high school. Thirty years later, my studio teaching experience continues to instill a passion for music and students that are performing in their own venues in school and the community. Knowing that the time I have with each person is leading them to grow and share their own abilities with others is truly the heart of where I think musical instruction should lead. Hello. My name is Kendra and I have been performing and teaching professionally for over 25 years. Utilizing the Suzuki curriculum and supplemental methods, I like to provide a solid technical foundation as well as tailor each lesson to my students' personal musical interests and goals including classical, Irish and Bluegrass fiddle styles, jazz, blues, and popular music. Kendra is amazing! She's perfect at finding problems and helping the student to resolve them while challenging to be better and better. Kendra has been a wonderful instructor for our daughter, Kate. She has a great way of "scaffolding" the learning, so that Kate is almost always at the edge of her abilities.... not too easy and not too hard. Kate enjoys Kendra's approach and is very comfortable with her. We have been very happy with Kate's motivation to practice and with her progress in learning. She especially enjoys the variety of music that Kendra encourages her to play. Can't find a teacher in Asheville, NC? The average cost of 60-minute violin lessons in Asheville is $50. While the exact cost will vary depending on the teacher, type of lesson, and your location, you should expect to spend anywhere between $50 and $50 per hour. For the best experience, we typically recommend 60-minute violin lessons. However, students looking for a more affordable option may want to consider a shorter lesson length of 45 or 30 minutes. On average, 45-minute violin lessons are 26% less expensive at $37, and 30-minute lessons cost 50% less at $25. Curious how much violin lessons cost in your area? Do a quick search to get local prices for the best violin teachers near Asheville. I actually wanted to learn to read and understand music. On a lark I found Stephanie on the takelessons site. We scheduled a call where I explained my experience, frustrations, and what I wanted to accomplish. I honestly did not think online classes would work. Was I wrong!! It takes great skill in verbally correcting bow holds, etc. and Stephanie is terrific. Before I was told to practice but I never knew HOW to. Stephanie assigns specific tasks, # of time to repeat, and duration for homework. She is so friendly and easy to work with. I would recommend her for any age or skill level??" "She's really cool. I really like her. She's patient when I can't figure it out, which is extremely often." Asheville, NC teacher: Laura S.
"We are so excited about how much we learned in thirty minutes. We are on our way!" the progress they both have made working with Kendra. She is very good at identifying where a student needs to make corrections and does it in a way that is positive and easy to understand. She is excellent at helping students find their own voice - interpreting the music and infusing creativity and meaning into each piece. We really appreciate how she has individualized her teaching approach to each of my girls' needs and goals, and how she is always positive and enthusiastic about their progress. When Kendra moved out of state, we opted to continue lessons with her online rather than find a new local teacher because she has been (and continues to be) such a great instructor. I highly recommend Kendra as a violin/viola teacher." ed us with our busy schedule. Clearly a talented violin player herself, we feel confident that Laura knows what she's doing in teaching our child."